< img> Caterpillar thought of everything when they were designing this particular work boot. They incorporated safety features, comfort technology, waterproofing, and insulation into these boots. Furthermore, they have made it on our list of one of the best work boots available. For generations, Caterpillar has been known for engineering some of the best heavy equipment for tough jobs, and now they are putting their skills to use in building boots that can tackle any environment. This is one of the best work boots in the market. Let’s find out how they rate with us. For protection, the Diagnostic work boot comes with steel toes, plus an additional rubber toe cap. They meet or exceed ASTM standards for Electrical Hazard protection. 200 grams of Thinsulate insulation keep your feet warm in colder temperatures, and the nylon mesh lining keeps them dry. The slip-resistant rubber outsole grips surfaces and keeps your feet firmly planted on the ground. Constructed with a genuine waterproof leather and features a nylon mesh lining to keep feet dry and breathable. You can find more boots in our comprehensive waterproof work boots page. A removable EVA insole with gel technology provides comfort and shock absorption for every step you take. The padded collar cushions the ankles and specific contours incorporated within the boot, mold and support your feet. In addition, the nylon mesh liner keeps your feet dry and allows them to breathe properly, plus the insulation keeps your feet cozy warm in cold temperatures. These work boots have steel toes and meet or exceed ASTM standards with a rating of F2413-11 I/75 C/75 Electrical Hazard approved. These boots are engineered to hold up well in very tough and rugged circumstances. With the premium leather, steel shank for support, steel toe with extra rubber toe cap, and very stable slip and oil resistant, cement construction outsole. 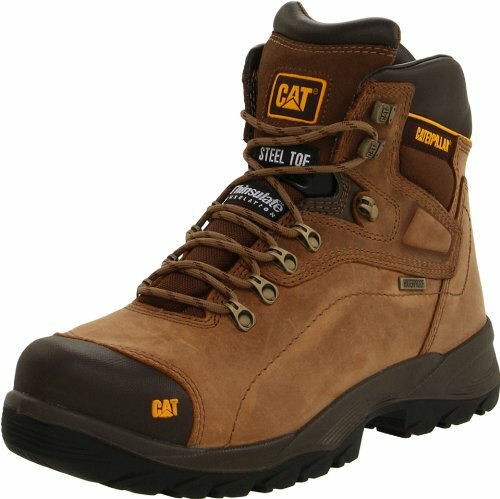 We would recommend these boots for field engineering occupations that require additional safety features, such as mechanics, electricians, construction, and heavy machinery operators. Also, they would be a nice selection for any position that will subject you to the outside elements like rain, snow, mud, and cold. The size typically runs large for these work boots; we would suggest a size or half size smaller than your regular shoe size. However, larger stores such as Amazon have an excellent return policy if you are having a size issue. The Cat Diagnostic work boot is rugged and well designed with its high cut, 6” inch shaft, metal hardware for easy and secure lacing. The tongue even pulls out further so you can easily slip your foot in and out of the boot. In addition, they have a unique handsome look that oozes toughness from all angles. These are not your everyday boots for casual wear, they are specifically made for a purpose, and that is hard work.